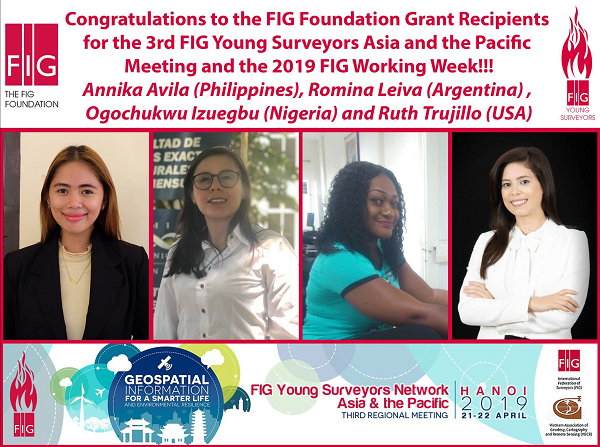 A big thank you to everyone who applied for the FIG Foundation Grant to attend the Third FIG Young Surveyors Asia and the Pacific Meeting and the 2019 FIG Working Week in Hanoi, Vietnam! The FIG Young Surveyors Network and the FIG Foundation would like to invite all Young Surveyors to apply for funds in order to attend and participate in the 2019 FIG Working Week and the FIG Young Surveyors Asian and The Pacific Meeting to be held in Hanoi, Vietnam from 21 to 26 April 2019. Remember to provide all necessary details and answers and do not forget to submit all additional requirements to fig.ysn.funds@gmail.com on or before the deadline on 27 January 2019. Non compliance will result in incomplete application thus, will not be considered. The FIG Foundation Grant will cover: travel costs (e.g. airfare, train, bus), accommodation, meals, the FIG Working Week Registration Fee, the FIG Young Surveyors Meeting registration fee, the FIG Foundation Dinner, and the FIG Gala Dinner. As a reminder, all previous FIG Foundation Grant recipients are not eligible to apply. Please check the official FIG Working Week 2019 website http://www.fig.net/fig2019/ for more information, news, and events. The FIG Foundation invites all Young Surveyors to apply for funds to participate in the 1st Young Surveyors African Meeting (YSAM) and the 2018 FIG-African Regional Network Meeting taking place in Gaborone, Botswana, on the 16th and 17th-19th of October respectively. Please provide the required documents to youngsurveyors.africa@gmail.com. The latest date to submit your application is the 7th of September, 2018 at 17.00GMT. NSPS and the FIG Young Surveyors Network are hosting the 2018 NSPS/FIG Young Surveyors North American Meeting. There will be sessions on the NGS 2022 Datum update, leadership, business, and technology. 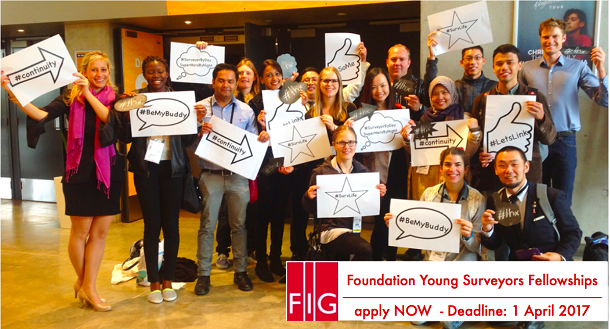 The FIG Foundation would like to invite all Young Surveyors to apply for funds to participate in the meeting. To apply, please fill in the form at the link below and all of its required fields. Please remember, to submit all additional documents to nspsyoungsurveyors@gmail.com before the deadline 17 August 2018. Previous FIG Foundation Grant recipients are NOT eligible to apply. At FIG Working Week 2017 FIG Foundation Grants were furthermore given to: Biplov Bhandari, Nepal, Mladen Femic, Montenegro, and KaarinaToivo, Namibia. The FIG Foundation Young Surveyors Fellowships will provide funding for individuals to cover the costs to attend and participate in the FIG Working Week 2017, including participation in all FIG Young Surveyors activities before and during the Working Week. The Fellowships will be awarded exclusively to nationals of developing countries¹ who must be living in one of the eligible countries. Fellowships include round‐trip travel costs to Helsinki , visa (if required), accommodations, registration fees for the FIG Working Week, FIG Young Surveyors activities, per diem allowance and FIG Foundation Dinner. The FIG Working Week 2017 will be held in Helsinki, Finland, 29 May ‐ 2 June. In addition to the Working Week, the FIG Young Surveyors European Meeting (Sunday 28 May) and young surveyors sessions will be organised and contribute to the networking of young surveyors internationally, to introduce young surveyors to the FIG community, and to provide for the opportunity to learn more and share the young surveyors’ vision for the future of FIG. Additionally the FIG Foundation Fellowship winners are invited to join the UN-Habitat GLTN Awareness Training on STDM on 29 May. Deadline for Application is 1 April 2017. Groenendijk and Prof. Paul van der Molen all wearing the Young Surveyors shirt that was used at the Charity Run, organised by the Young Surveyors that also raised funds for the FIG Foundation. FIG Foundation wants to thank those who have worked actively throughout the year for the Foundation and to promote FIG and the Foundation around the world. At the meeting FIG Foundation decided to award Wallace Mukupa, Ningbo University China, with the FIG Foundation Ph.D. Scholarship 2016. Congrationaltions to Wallace Mukupa. 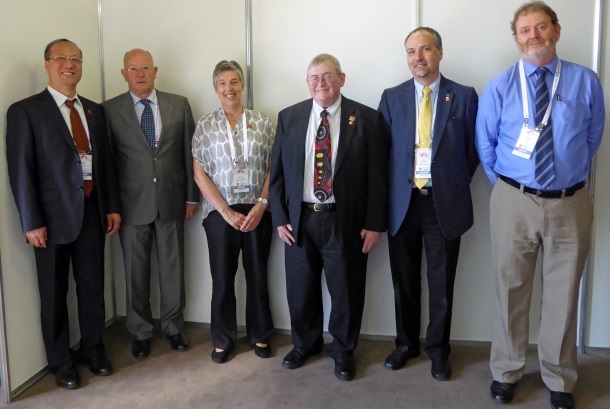 The FIG Foundation had a meeting in Sofia, Bulgaria in May 2015. 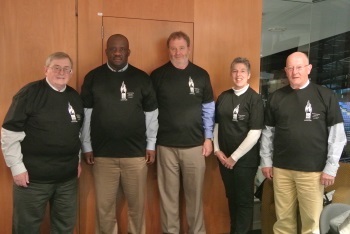 The board held its official meeting in Kuala Lumpur, Malaysia during the 2014 Congress. Furthermore the board has been in frequent contact through email. At the meeting Young Surveyors were represented by Chair Kate Fairlie and Chair Elect Eva- Maria Unger, who thanked FIG Foundation for the cooperation throughout the last years. Eva Maria Unger informed that CNGeGL, the National Council of Italian Surveyors, has decided not to continue to offer the International Training Course on Topography for Young Surveyors. Everyone expressed gratitude to the Italians for having offered the course and agreed that it is very unfortunate that this great opportunity for young surveyors to meet and experience new knowledge is no longer available. There was a discussion of the funding of the Young Surveyors Meetings, if it is permanent. It was agreed that the funding should not become permanent and should not exclude others of being supported. At the meeting in Kuala Lumpur the board expressed sincere thanks to Keith Hofgartner representing FIG Platinum Corporate Member Trimble Navigation for generous continued support of the foundation including sponsorship of the FIG Foundation Dinner. John Hohol informed that Trimble had had several requests from a school in Burkina Faso about funding of equipment. Trimble asked FIG Foundation to cosponsor a donation. To make sure that funding will help to improve the learning environment it was decided that Trimble is to deliver an analysis of the state of the art of the school.